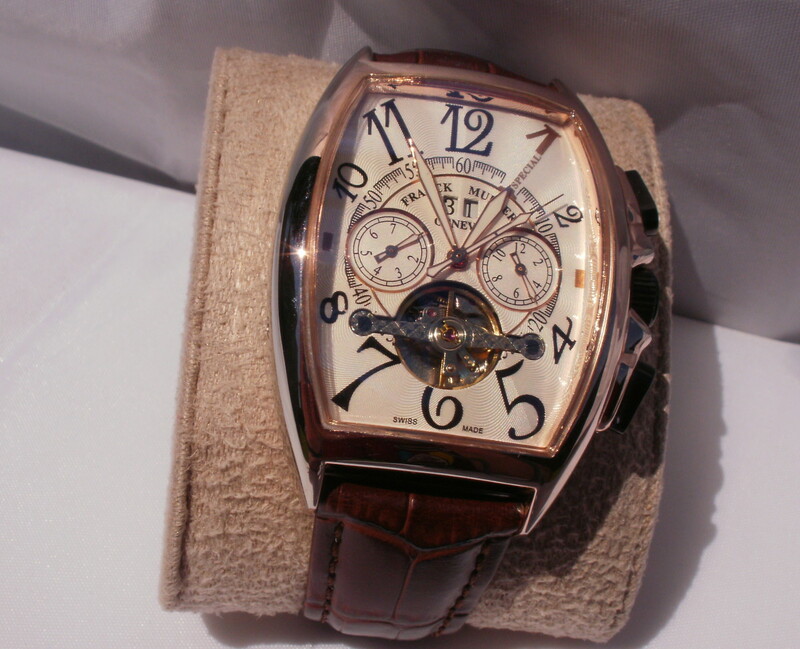 Although I have little use for a chronograph, shiny timepieces loaded with functions do tend to attract my attention. I feel the same about computers, bikes and automobiles; pile on the chrome and accessories and I might pull out my wallet. My original chronograph was a Benyar BY-5103M. 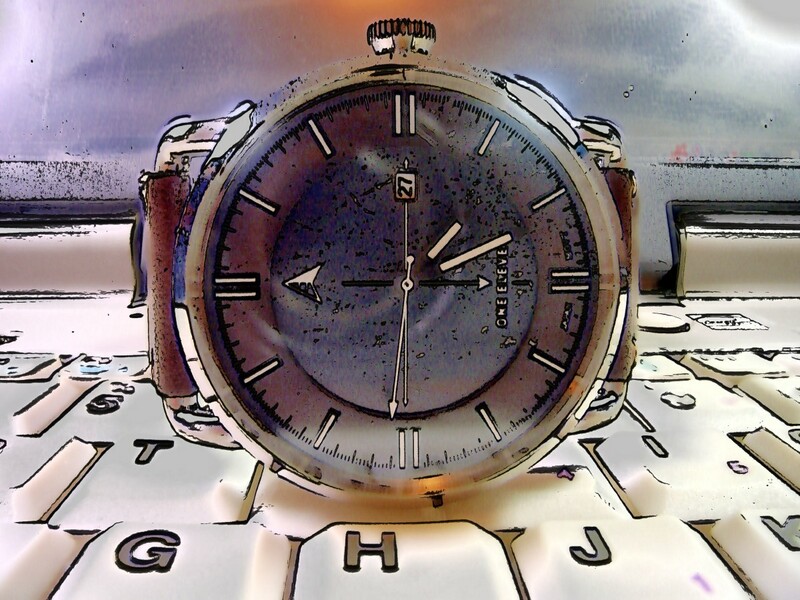 It’s an excellent watch, but the timepiece’s alloy case seemed a bit cheap. I decided to upgrade, and Corgeut appeared to offer the best balance of quality and price. The Corgeut C02006PYR weighs in at 100 grams (3.55 ounces) and, including the crown, spans 50 millimeters. It is 16.5 millimeters thick. 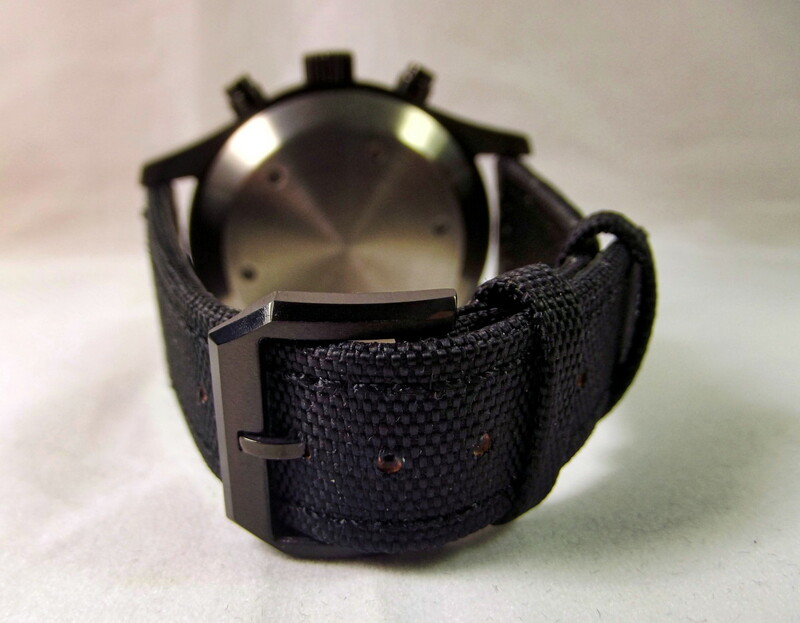 The watch is housed within a stainless-steel case coated with a flat-black PVD film. Physical vapor deposition (PVD) is characterized by a process in which the material goes from a condensed phase to a vapor phase and then cooled to a thin film. PVD coatings can be harder and more corrosion resistant than those applied by electroplating. The stainless-steel caseback is marked by six circular indentations, suggesting a specialized tool will be required to open the watch. Specifications note that this timepiece is equipped with a Japanese movement. 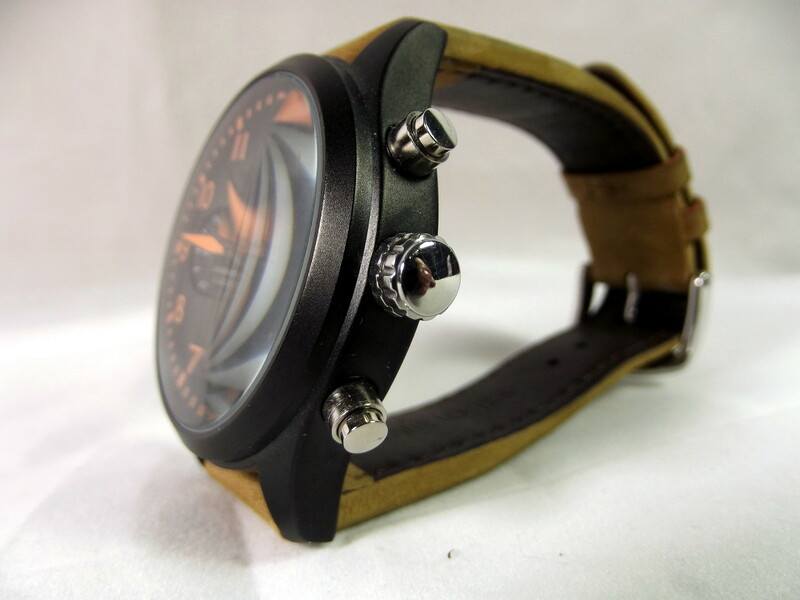 The watch’s dial is black with large, easy to read Arabic numbering and appears to be a version of the sandwich design. The hands are whitened with medium quality luminous paint. A window on the right side provides a view of the date, and two circular holes allow the inclusion of subdials. 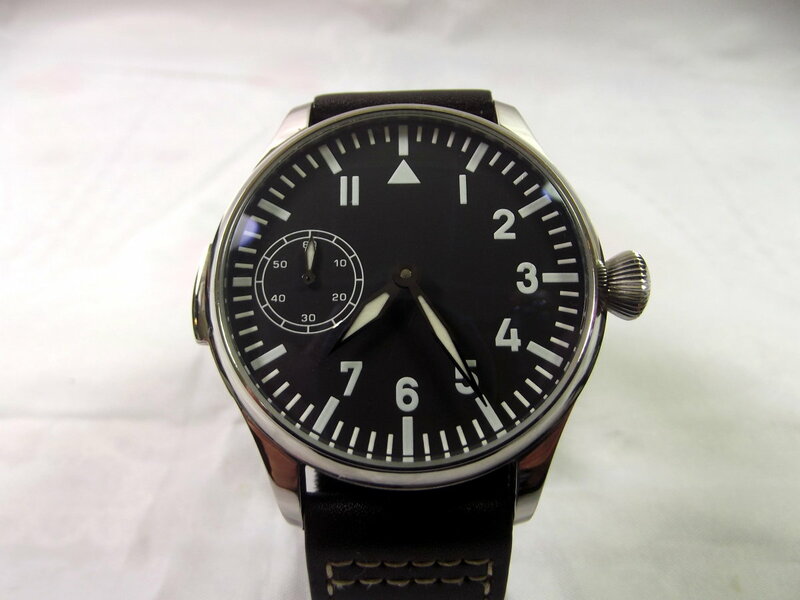 The bottom subdial is utilized as the timepiece’s second hand. The hand normally reserved for that purpose, and the top subdial are used to keep track of elapsed time. This watch’s crown is flanked by a pair of pushbuttons. 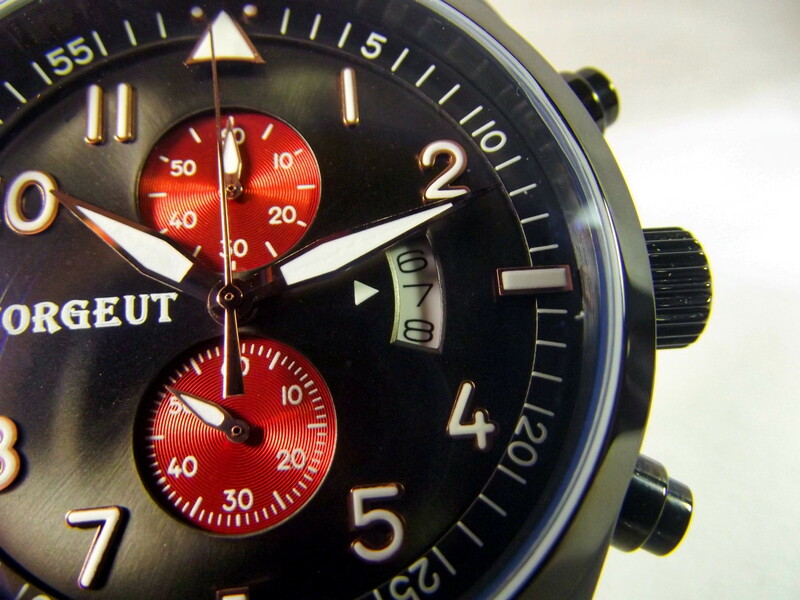 The upper button starts and stops the chronograph. The lower pushbutton is used to reset elapsed time. Date and time are adjusted via the timepiece’s crown. 22-millimeter lugs are utilized to attach a fabric band composed of cloth and leather. 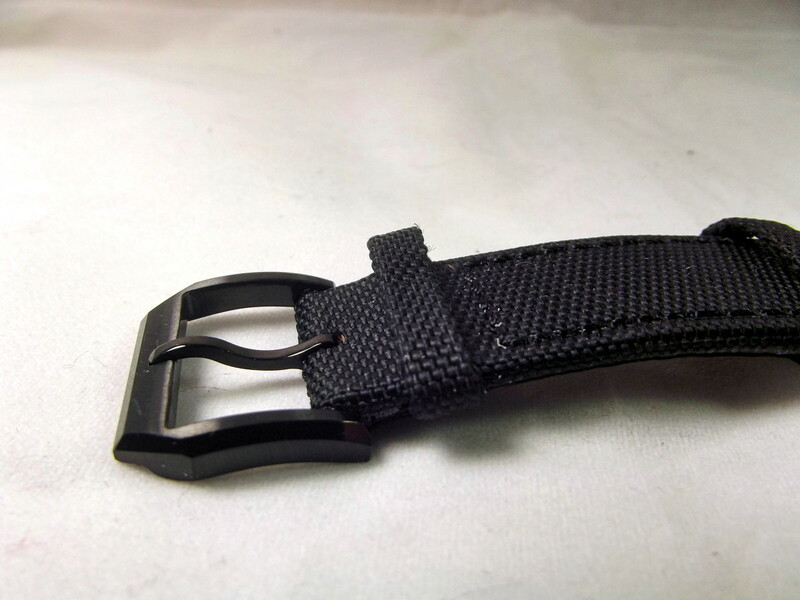 Both the strap and buckle are colored black to match the watch’s case. 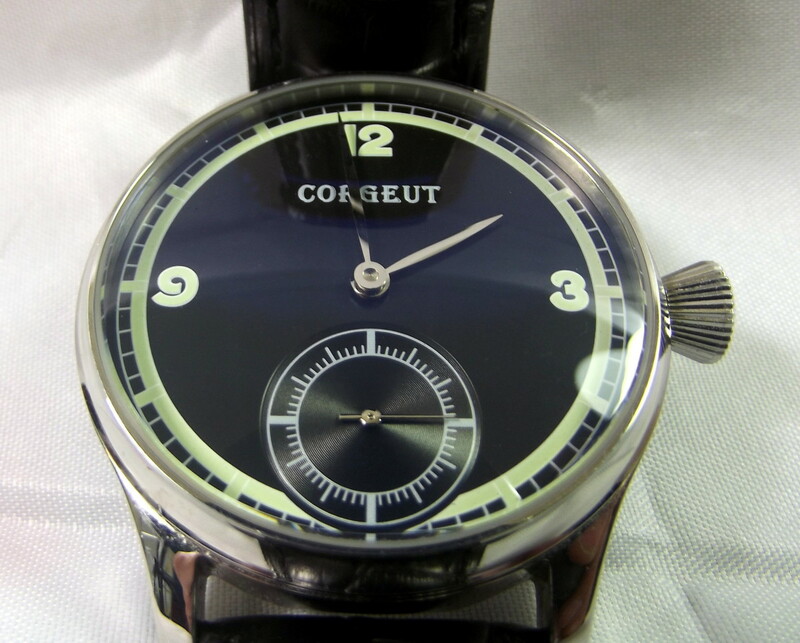 Corgeut provides many versions of this model with an assortment of differently colored cases, dials, and subdials. 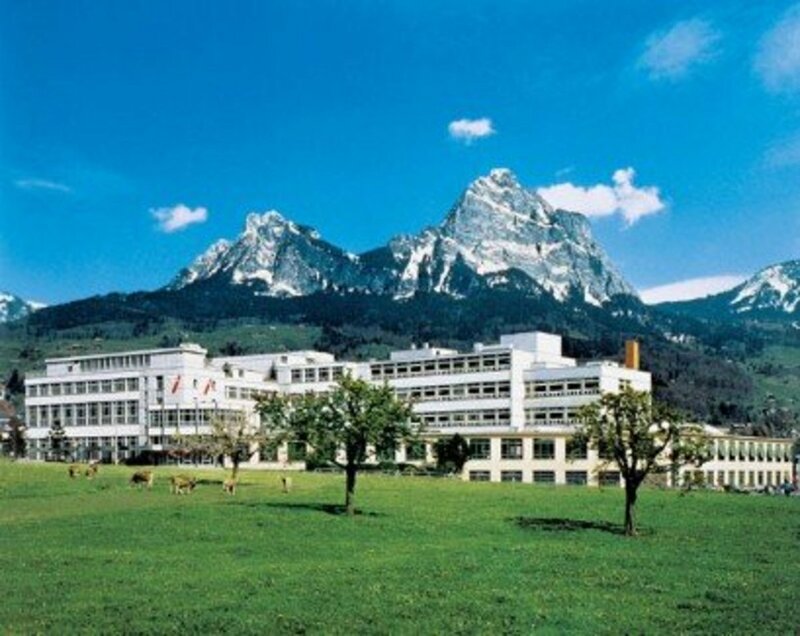 Corgeut has been manufacturing timepieces for several years, but it was not until February of 2017, that this company was trademarked by Zhang, Gong Wei of Hubei Province. While they do not share the same ownership, it is likely that Corgeut and Parnis are closely associated. Their designs are similar, and both companies utilize high-quality components. E-commerce websites that sell one of these brands usually handle both and, quite possibly, they are manufactured in the same factory. It comes down to individual taste, but I think it’s a shame to cover a quality stainless-steel case with a flat black coating. Those that do like this effect, however, will appreciate how closely the manufacturer has matched this timepiece’s case, strap, and dial. Corgeut has created a beautiful dial. The sunken, red-colored subdials convey an impression of quality and precision. They contrast well with the black dial, white numbering, and oblong shaped date window. The fabric strap is an interesting change of pace, but I do prefer leather. 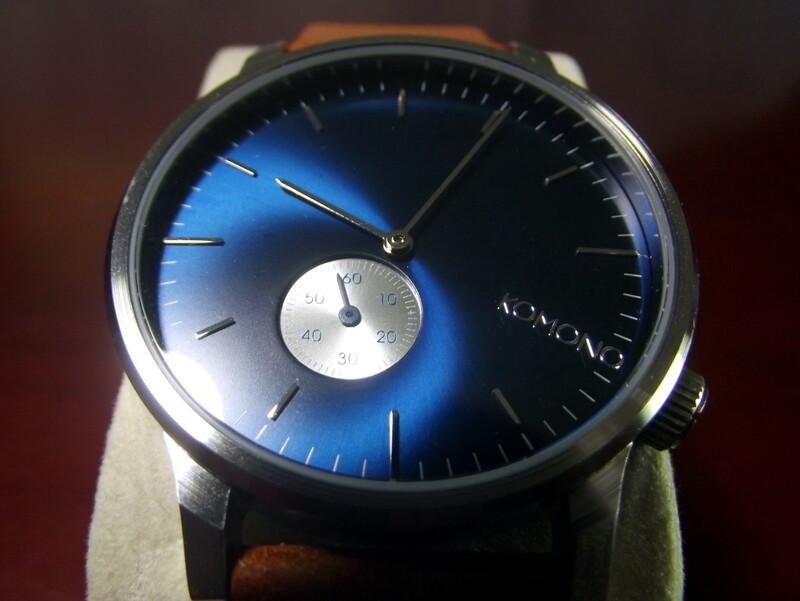 The case of this watch is constructed from 316L grade stainless-steel. This material provides excellent resistance against corrosion. The case is further protected by a PVD film. A hardened glass crystal shields the dial. Corgeut has equipped this timepiece with a Japanese quartz movement. Time and date adjust easily and smoothly. 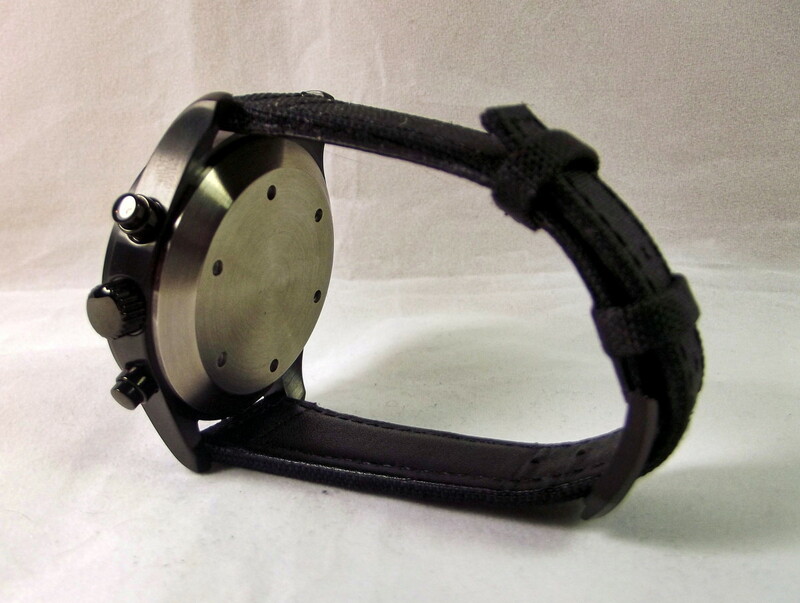 The chronograph functions correctly, providing the ability to utilize this device as a stopwatch. The fabric strap appears to be quite durable. I suspect it might outlast a leather strap of similar thickness. Like many Chinese manufactured watches, this chronograph’s greatest drawback is water resistance. It is rate 3ATM, which translates to splash-proof only. 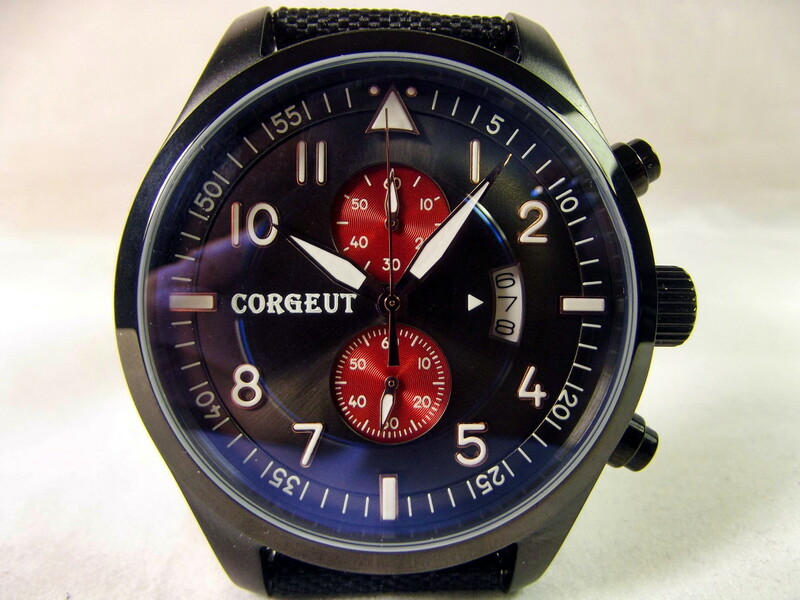 The Corgeut C02006PYR is a well-designed timepiece and because it is available in a variety of colors, should appeal to many potential customers. 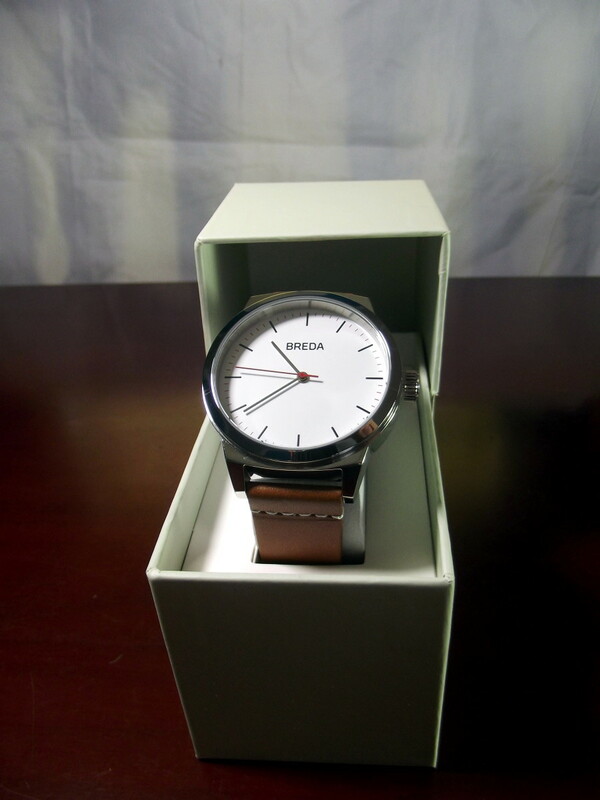 I recommend this watch. 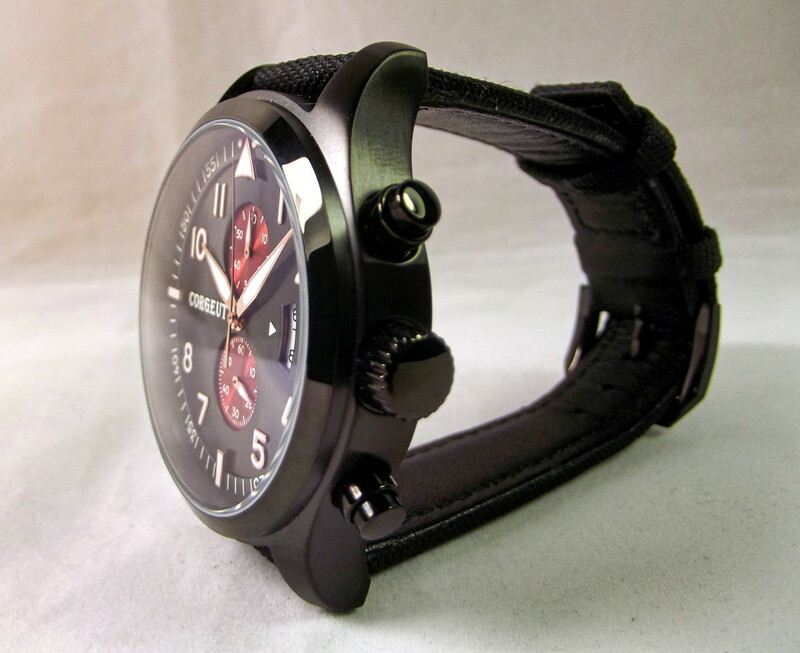 There are many different types of watchbands available. In the following poll, I am attempting to determine which are the most popular. Please take the time to provide your opinion. 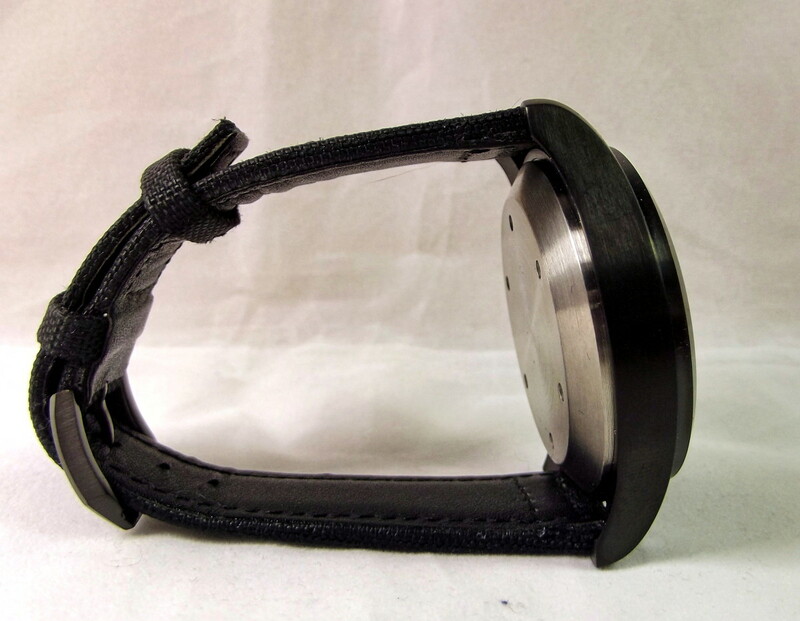 Which of the following straps is more likely to pursuade you to purchase a particular watch?